Today, the City of St. John’s and Happy City St. John’s announced a collaboration to enter into the Canadian Smart Cities Challenge, an initiative of the federal government to encourage communities to seek smart, transformative solutions to big problems. The application for St. John’s will focus on becoming a city of residents who, with the application of technologies, can better embrace and celebrate an active and healthy lifestyle. Integrated Mobility Network is a people-focused project that will combine transportation, planning, urban design and land use concepts and principles to improve residents’ ability to move around the City more easily. Key to developing a proposal will be many partners in the community. Happy City, a local non-profit with the mission to “inform, encourage, and facilitate public dialogue around civic issues in St. John’s,” is an active partner with the City of St. John’s to facilitate discussions and prepare the application for the Smart Cities Challenge. A volunteer ‘Challenge Committee’ has been struck to help advise and guide the direction of the application, and Happy City is coordinating an online survey and public forums to engage the community on the topic; previous engagement work in support of other programs such as Healthy Communities initiative will also help inform the content of the application. Applications for the challenge must be submitted by April 24, 2018, after which juried finalists will be awarded $250,000 to flesh out their proposal. 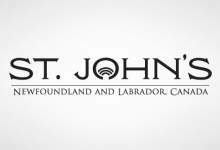 The St. John’s application will target the $10 million prize. To participate in the development of the application, residents will be encouraged to respond to a survey which will be available soon, or to participate in an upcoming public discussion, which will be announced in the coming week on both stjohns.ca and happycity.ca. The federal minister of Infrastructure and Communities has issued a Canadian Smart Cities Challenge. This initiative challenges communities to bring together a range of partners from public, private, education and community-based sectors to define a common “big problem” and craft a solution utilizing data and connected technologies. Applicants can only apply to one category. The City of St. John’s will apply for one of the $10 million-dollar prizes. The challenge is not for funding an ongoing program, service or infrastructure, but for creating something new, for championing new ideas. Given “Challenge Areas” are not required to be the legislative jurisdiction of the city as an entity, as capital city St. John’s has the opportunity to finally take a meaningful lead on a serious, province-wide issue: public health. On balance, the population of St. John’s are aging, predisposed to diabetes and obesity, and cower away from our typical damp, windy weather. This has led to us being the capital city of the unhealthiest province in Canada. Compounding these health challenges is a car-dependent culture that also faces a grim provincial financial reality. Happy City St. John’s, a local non-profit with the mission to “inform, encourage, and facilitate public dialogue around civic issues in St. John’s,” is an active partner with the City of St. John’s to facilitate discussions and prepare the application for the Smart Cities Challenge. Happy City St. John’s has a proven history of community facilitation and has existing relationships with community stakeholders in St. John’s which can be leveraged to ensure rich input from residents throughout this project. Prior to the initiation of this partnership, Happy City has been actively engaged with community stakeholders and members of the community regarding mobility. Applicants have until April 24, 2018 to complete and submit their initial applications on the Impact Canada Challenge Platform. Applications will be reviewed based on a series of weighted criteria. The guidelines and applications will be reviewed by a jury. The jury will select finalists by Summer 2018.